I am taking a break from Paperwork Wednesday (yuck) to post this extra little card. I am so loving Online Card Classes Summer Card Camp 2 and I wanted to make another card based on the weekly color scheme and one of the sketches. This was really easy to make using one sheet of patterned paper and some Washi tape on a card base. I covered both sides of my chipboard tabs with the Washi tape and then decorated each. The border of the card is three strips of Washi tape. 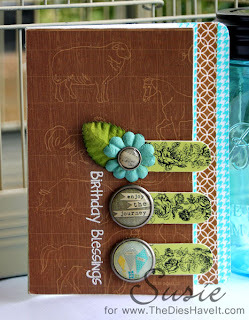 I added a heat embossed sentiment and I was done!. I've taken a break from ALL work around the house while I'm busy "studying" this class! Your idea to use Washi Tape on your card is smart -- looks very good!